To discuss the possibilities and prices, look at the examples of other projects in the ’tile galleries’ and ‘techniques’ pages and then phone, or write, even better visit me in my studio in Bath. Please phone me to start with. It really is so much quicker and simpler to sort out what you need, and surprisingly, is far more more effective than email at this stage, which we can use later in the process! I enjoy working with the client to produce bold and original designs so that each design for ceramic wall tiles is unique- figurative or abstract, contemporary or traditional in style from a small tile panel to a complete room of tiles to suit and enhance a particular interior or situation. Tin glaze tiles hand painted, multi colours with myrtle leaves. Swans. Wax resist outlines [ cuerda seca] with a single coloured white glaze. The wall tiles range from classic blue and whites and quieter tones to luminous vibrant colours often used with cuerda seca (dry line), something I really enjoy which provides an opportunity to use my own wide range of glazes and colours enhanced by a lively drawing style. Bespoke hand made tiles, or hand decorated tiles – Bathroom tiles, kitchen tiles, swimming pool surrounds. Foyer panels, Jacuzzi surrounds, wet room tiles, splash backs, dado tiles, shower tiles, commemorative or celebratory panels, border tiles, single tiles and small panels are all possible! , but the techniques I use are not good for portraits- pets included, landscapes and herbs! These tiles are not suitable for outside in the UK – not frost proof, nor are they suitable for floors – too slippery! PRICES page will give you an idea of potential costs. 153mm. sq. x 6mm. thick. [6″ sq. x 1/4″ thick] (This is the most useful and practical size). 99mm sq. x 6mm. thick [ 3 7/8″ sq. x 1/4″] (For simple or plain tiles only! 203mm. x 102mm. [4″ x 8″] . (Best for plain colours only). For details of handmade clay tile sizes see ‘Handmade tiles’ page on menu. Discussion -about what you want – subject, scale of project, colours, technique, prices, price range. Measurements – Before I price your project you will need to send me accurate measurements and clear photographs of the walls / room to be tiled and of all hazards such as pipes, shower head, taps, sockets, switches, etc. This is best done when all porcelain fittings, cupboards, electrics are fitted – things tend to move. The tile area is every other trade’s waste space and will need defending against invaders! Colour – Compatible and complementary glaze colours can usually be produced to go with the room and fittings. An exact match is not guaranteed since sadly ceramic colours cannot be mixed like paint, but have complex chemistry affected by firing. Please note that colour will vary under different lighting and on screen. Colour samples– It helps greatly if you can provide real, physical colour samples of anything like paint, curtains, counter tops, bath, stoves, floor surface etc. for colour matching. NB.However carefully the ingredients weighed out colour will still vary from batch to batch so please order for your full needs in one go and allow for some variation. You are ordering handmade / glazed / decorated tiles not factory production! 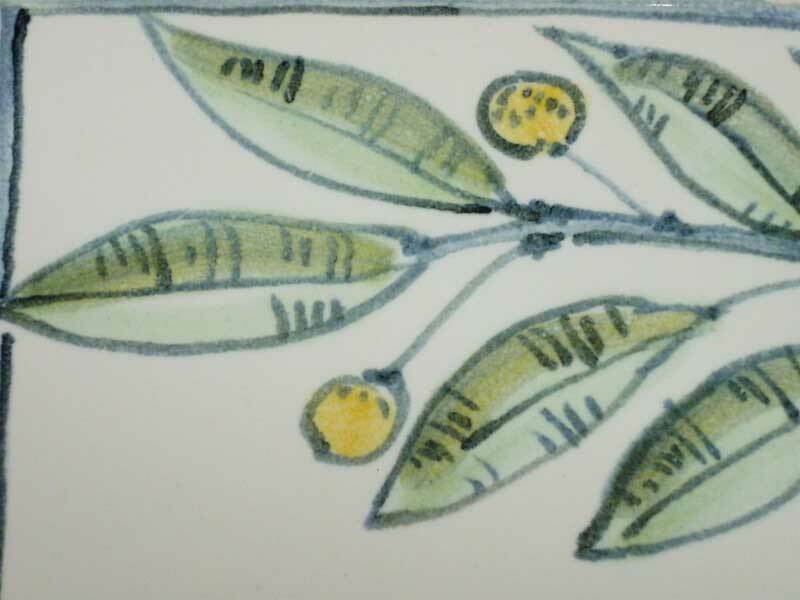 Drawings – When all the important information has arrived I can then work on scale drawings of the tile panels and send them with a selection of samples of glaze colour for you to choose from, plus estimates for you to look at and discuss. 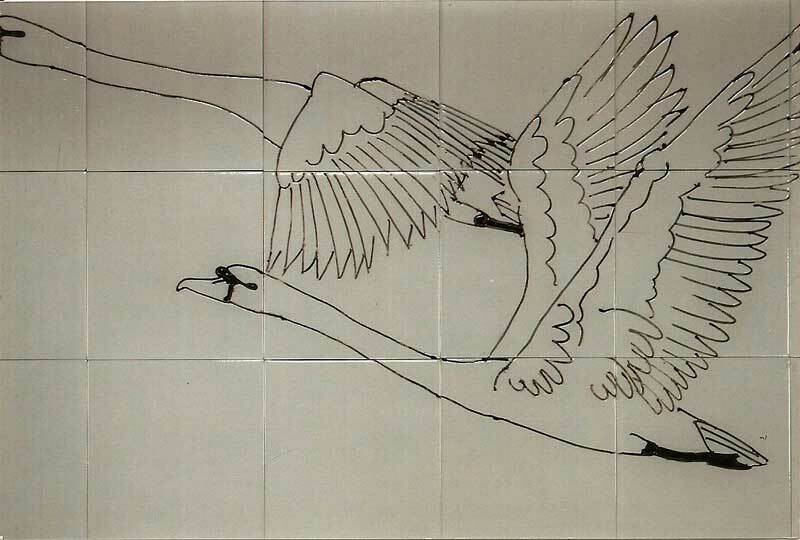 Making – Once you have approved the project I draw out the decorated tile panels full size to work from. The tiles [and glazes] are made, decorated and finally fired in the kiln. Each panel is supplied with a numbered tile plan, spacers, and information for the tiler. Commissions -are designed and made in chronological order from the confirmation date. Time to delivery depends on what jobs are on the list already and how complex your commission is. I do all the work myself and have no slaves in the cellar! With clear decisions and your help the work can usually be produced promptly and efficiently. Most time is normally spend in sorting out what is needed. I can usually give you an approximate completion date when the designs/drawings, and colours are agreed. HELP – Just ring me on 01225 460805..